Love isn't always an easy road; but it's always a worthwhile one. Perhaps you've been following our journey since it began when we hosted a child from Eastern Europe last Christmas or maybe you've just read a bit about hosting an orphan and don't know much more ... and perhaps something calls to you about opening your own home and sharing your own family with a child who doesn't have one of his or her own. But maybe the reality is that you're still on the fence about hosting. There are so many reasons that tempt us to toss the idea out of our minds because honestly it can seem daunting or even impossible. Before you let the thought fade, though, here are six reasons you may want to consider allowing God to show you that He specializes in making the impossible possible. Hosting a child from another country who doesn't have a family is is both heartbreaking and heartwarming. As we shared Christmas and all of the traditions that accompany our advent and Christmas celebrations, I witnessed so much beautiful interactions between our host daughter and our young boys, then 6 and 4. My children thoughtfully included her into our traditions and she in turn embraced our family and our traditions eagerly. Watching the love grow between all of our members in our family with a complete stranger turned family member has forever changed my heart and has reminded me that Christmas is about love -- God's great love for us in sending His son to us. Before our host daughter came to live with us for a month, I knew there were orphans. 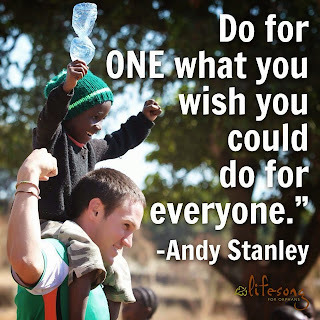 But I didn't think about them because I didn't see orphans on a daily basis. They were not even on my radar. But then I held her in my arms. And I knew her name. And I loved her in a way I cannot explain. And orphans then became to me people instead of numbers I had read in statistics. We can ignore numbers. We couldn't ignore Eta. Or Vika. Or Alina. Or Nauris. Or any of the number of other children we've come across during hosting. Our host daughter boarded an airplane in her native country and traveled across the Atlantic via plane for the first time to spend a month with a family she'd never met and who didn't even speak the same language. And she was only 12 years old. When we first met our beautiful host daughter, she looked completely bewildered and overwhelmed. We quickly learned that hugs and laughter translate well into any language. As we settled into life during the first few hours and then days of her visit, I was inspired by her resilience and her desire to receive and give love despite all of the disappointments and hardships she'd faced in her short life. I recalled the feeling of terror I'd experienced before hosting began about welcoming a stranger into our family and recalled how others had said we were so brave for doing this. As I watched our host daughter strive to make heart connections, I realized bravery was involved in hosting -- but most of it was needed by the children being hosted! After all, we were in our own home, with our own families, speaking our own language. Talk about bravery! These children are so courageous, and our host daughter showed me that I could live and love courageously, too! The world is so much bigger, so much more vast than what I can see when I'm looking at what's before me. I recall days when I thought and lived like the world revolved around me and my small family. When we met our host daughter I began to realize on a greater scale just how small I am and just how vast the world is. My children also began to grasp the smallest realizations of just how big our world is and how great the needs. We've realized as a family that while we cannot nearly meet the worlds great needs, we can do something. No one can do everything; but everyone can do something. We have learned that while we cannot save the world we can go where our deep passion meets the world's great need. 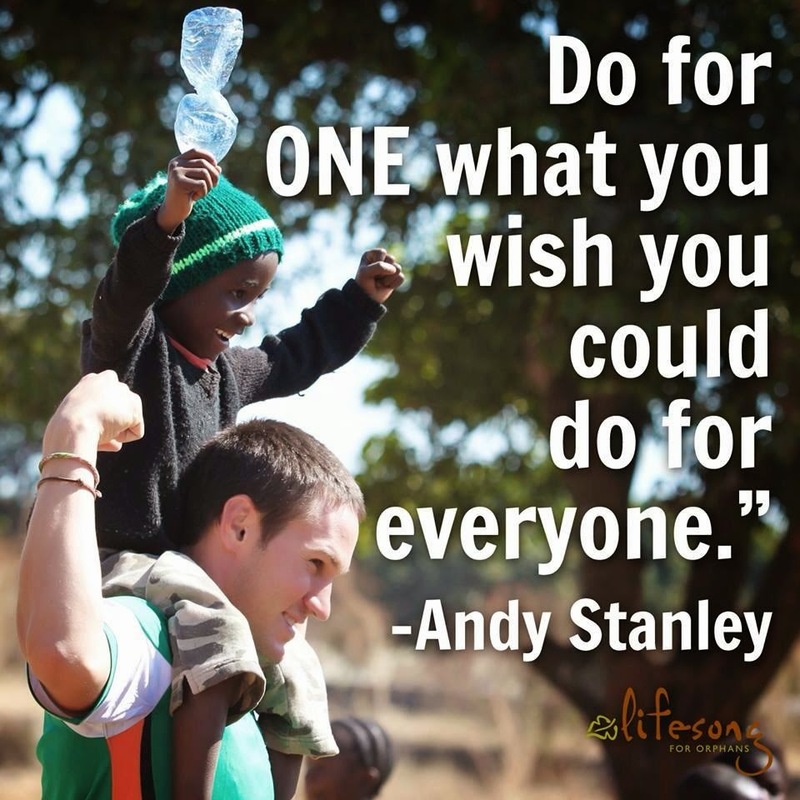 And we have taken to heart a great perspective from Andy Stanley: "Do for one what you wish you could do for everyone." Though we'd read James 1:27 many times -- "Pure and genuine religion in the sight of God the Father means caring for the orphans and widows in their distress and refusing to let the world corrupt you." -- we didn't really understand it until our host daughter came into our lives. We then began understanding how God wants us to love and how God loves us. Orphans have no standing in the world -- they have nothing with which to repay for the love, time and effort. This is the way God loves us -- though we have nothing to offer him but our hearts, he loves us and cares for us as His own. People have often mused about how we've changed our host daughter's life for the better. And I know this is true without a doubt. We loved her with every ounce of love we had and then some -- often praying and asking God to multiply our efforts in only a way He could deep within her heart. I know we've given her a picture of what it means to be welcomed into a family and what it means to be part of a family. I know we've made a difference in her life, and our love has been tattooed on her heart. But you know what else? God used her and hosting to change our lives ... to change our hearts. Our family has had our collective heart broken for children who don't have families. Even our young sons at ages 5 and 7 are vested in praying for, advocating for and fundraising for adoption. When discussing if we should host again and/or continue in the adoption journey with a different child or children our oldest son exclaimed, "Yes! Of course! Every kid needs a family!" Remember, love isn't always an easy road; but it's always a worthwhile one. God knows where each of us would be without it. Thank you for so eloquently expressing your thoughts on hosting. My family hosted a Ukrainian orphan this summer, and I feel exactly the way you do. Praise God for His goodness & lovingkindness!